At Crestwood, sustainability means operating in an ethically, environmentally and socially responsible manner; focusing on safety; respecting and supporting our communities; protecting the environment; and developing our employees. As we embark on our sustainability journey, we are focused on integrating sustainability across our business, as it will propel our success and differentiate us from our competitors. Building the culture of sustainability and implementing sustainability practices throughout the organization. 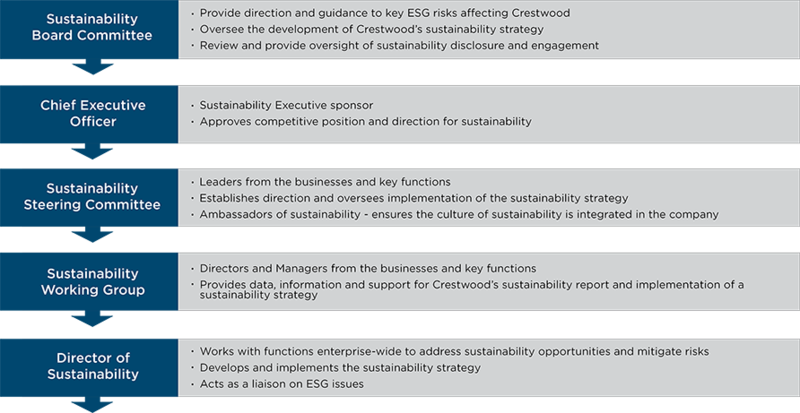 In 2018, Crestwood formed a Sustainability Committee at the board level that will ensure that environmental, social and governance risks are incorporated into the company’s long-term business strategy. It will oversee the development of the sustainability strategy as well as review, comment on, and ultimately approve our annual sustainability report. Crestwood is committed to transparency and disclosure of its environmental, social and governance (ESG) performance. We are currently developing our baseline sustainability report that will be published online in June 2019. We will also be creating tailored ESG disclosure to meet the needs of our various stakeholders. Please check back to read more. Crestwood adheres to a strong set of corporate values and has adopted and implemented a number of policies and practices to ensure our standards are implemented throughout the organization. Thank you for your interest in Crestwood’s sustainability performance. We look forward to continuing the dialogue, please contact us with any questions you may have.